﻿Working to make Old Goodwood the best place to live in Baton Rouge! Please be vigilant as unlocked cars continue to be enticements for criminals. When you see something that doesn't seem right, call BRPD, 389-2000. AS WE MOVE TO A NEW ERA, PLEASE BE PATIENT AS UPDATES AND ADDITIONS TO THE BRGOODWOOD.COM WEBSITE WILL BE COMING CONTINUOUSLY FOR ​THE NEXT SEVERAL WEEKS. THIS IS IN AN EFFORT TO IDENTIFY AND MEET THE NEEDS OF THE ASSOCIATION, ITS MEMBERS AND THE RESIDENTS OF OLD GOODWOOD. 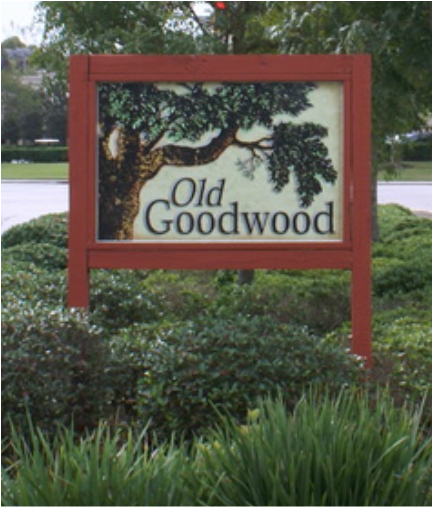 The neighborhood referred to as Old Goodwood or Goodwood Place was developed beginning in 1932 on parts of the 2,000 acres that comprised Goodwood Plantation. The Goodwood Plantation home is located on Goodwood Aveue, slightly west of Lobdell Avenue. Built around 1852, the plantation home was said to be the first house in Baton Rouge to have running water, bathrooms, bathtub, shower and built-in washstands. Goodwood is a diverse but tightly knit neighborhood that includes homes ranging from modest bungalows to $1 million-plus mansions. While many Goodwood residents have lived in their homes for decades, younger families with school-age children are among new homeowners flocking to the neighborhood. Despite a great deal of commercialization around the edges, Goodwood has maintained its neighborhood qualities — thanks largely to a vigilant and active Goodwood Property Owners Association (GPOA). The association is 100 percent volunteer driven, managed on a day-to-basis by its Board of Directors. Since GPOA is involved in such a wide range of projects, volunteers are needed and welcomed to keep the organization functioning for the good of all residents. Residents in areas that want to be involved for specific localized goals or projects are encouraged to volunteer. The Board of Directors continues to focus on addressing the needs and requests of the membership and must have support and input from residents to be successful.